Looking for a night of inspiration alfresco? Come to the final 2017 Rhythm on the River performance featuring BalletMet! 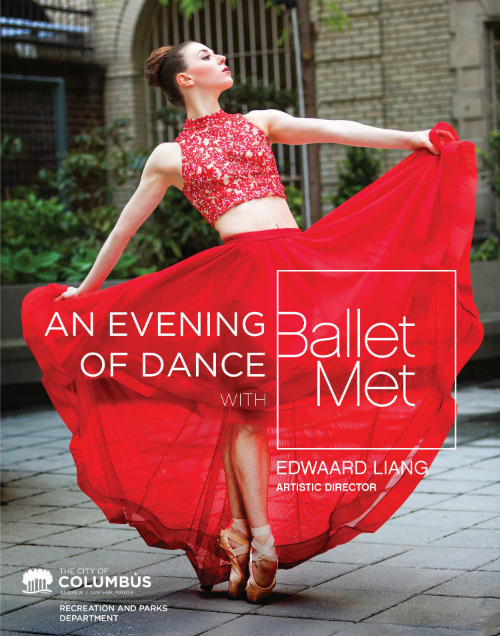 The Columbus Recreation and Parks Department and BalletMet will partner to show case an evening of exquisite dance Friday, August 25 at Bicentennial Park at 8 p.m. and food and beverage sales begin at 6:30 p.m. This event is free and open to the public so bring your family and friends to BalletMet’s awe-striking performance. Performing excerpts and iconic moments from the company’s 2017/18 season, BalletMet will showcase both classical and contemporary works from “Parallel Connections”, “Dorothy and the Prince of Oz,” “Giselle” and more! BalletMet’s upcoming season is packed with company and world premieres and features cutting-edge works from choreographers including Ohad Naharin, Jerome Robbins, Andrea Schermoly and BalletMet artistic director Edwaard Liang. Since its formation in 1978, BalletMet has provided excellent artistic merit in the field of dance to Central Ohio. BalletMet has added hundreds of company premieres to its repertoire and produced 150 world premieres, touring countries such as Egypt, Poland, Russia, Spain and Canada. The company has also developed a series of educational and outreach programs, including the Wiggle Jig, Moving Into Literacy and Urban Dance and Wellness Classes, which reach more than 30,000 people annually, many from minority and under-served groups. We’ve got your dinner plans covered! Donatos will be providing delicious pizza by the slice and whole pie. The Columbus Recreation and Park’s Strawberry Food Truck will feature West African inspired cuisine by Asempe Kitchen and Too Good Eats’ local organic popsicles. Proceeds from the food truck benefit CRPD’s free summer meals program. Date & Time: Friday, August 25 | Food & Beverage Sales 6:30 p.m. | Performance 8 p.m. Rhythm on the River is produced by the Columbus Recreation and Parks Department and made possible through the support of the Scioto Mile Endowment Fund: Columbus Downtown Development Corporation, ABC 6/FOX 28, Rewind 103.5/104.3 FM, Donatos, WCBE 90.5FM and DoubleTree Suites by Hilton Columbus Downtown.